I noticed something on ibmpc5150's latest "IBM PC/Tandy 1000 floppy software on eBay or Amazon".. 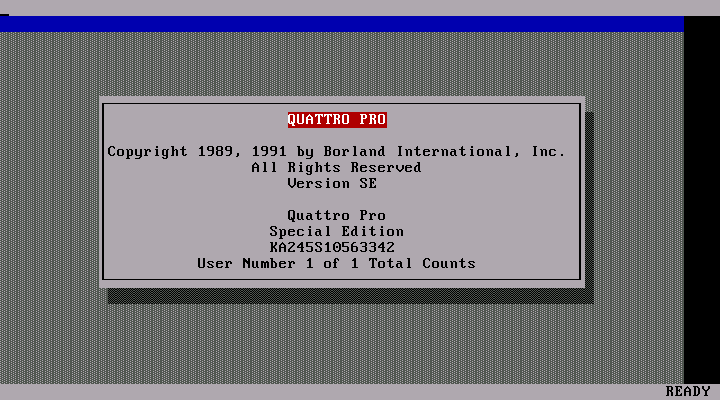 The serial number on the disk in the Ebay picture (KA245S10563342) is the same as the WinWorld splash screen for Quattro Pro SE 1.0 shown here. The Winworld versions are (4) 360k disks and the Ebay version is (5) 360k disks plus (2) powerpack disks, so unlikely these are the same packages. So, did all Quattro Pro SE 1.0 packages come with this same serial number? ?